National League top team - Astana (25-0) had no problems winning another game on Thursday. This time they crushed sixth ranked Barsy 2 (5-21) in Atyrau 98-41. Undefeated Astana have an impressive nine-game winning streak. Defending champion maintains first position with 25-0 record. Barsy 2 lost third consecutive game. Newly promoted team keeps the sixth place with 21 games lost. Astana are looking forward to face bottom-ranked Kaspiy Aktau (#7) at home in the next round where they are favorite. 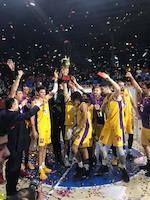 Barsy 2 will play against the league's second-placed Tobol in Kostanay and is hoping to prove to their fans that they can break losing series. National League top team - Astana (25-0) had no problems winning another game. This time they crushed sixth ranked Barsy 2 (5-21) in Atyrau 101-14. Undefeated Astana have an impressive nine-game winning streak. Defending champion maintains first position with 25-0 record. Barsy 2 lost third consecutive game. Newly promoted team keeps the sixth place with 21 games lost. Astana will play against bottom-ranked Kaspiy Aktau (#7) at home in the next round where they are favorite. Barsy 2 will play against the league's second-placed Tobol in Kostanay and hopes to get back on the winning track. The game in Aktau was also quite interesting. Fourth ranked Barsy Atyrau (13-9) played at the court of 7th ranked Kaspiy Aktau (2-22). Barsy Atyrau defeated Kaspiy Aktau 82-71 on Wednesday. Barsy Atyrau maintains fourth position with 13-9 record. Kaspiy Aktau at the other side stay dead last with 22 lost games. Barsy Atyrau will meet league's second-placed Tobol in the next round and it may be the game of the week. Kaspiy Aktau will play against the league's leader Astana (#1) and hope to secure a win. The game in Aktau was also worth to mention about. Fourth ranked Barsy Atyrau (13-9) played at the court of 7th ranked Kaspiy Aktau (2-22). Barsy Atyrau did not have too big problems and got a relatively easy victory 101-82. Barsy Atyrau maintains fourth position with 13-9 record. Kaspiy Aktau at the other side stay dead last with 22 lost games. Barsy Atyrau's next round opponent will be league's second-placed Tobol in Kostanay and it may be the game of the week. Kaspiy Aktau will play on the road against the league's leader Astana (#1) and hope to win that game. In the last two games of round 16 Sinegorie K. was destroyed by Tobol on the opponent's court 97-77. Tobol managed to outperform Sinegorie K. in a home game 93-83. Rather expected game in Kostanay where 5th ranked Sinegorie K. (8-15) was crushed by second ranked Tobol (16-8) 97-77. Tobol maintains second position with 16-8 record having ten points less than leader Astana. Sinegorie K. lost fourth consecutive game. Newly promoted team keeps the fifth place with 15 games lost. Tobol's next round opponent will be Barsy 2 (#6) in Atyrau. Sinegorie K. will play on the road against Almat.Legion in Alma-Ata and it may be a tough game between close rivals. Rather predictable result in Kostanay where second ranked Tobol (16-8) defeated 5th ranked Sinegorie K. (8-15) 93-83. Tobol maintains second position with 16-8 record having ten points less than leader Astana. Sinegorie K. lost fourth consecutive game. Newly promoted team keeps the fifth place with 15 games lost. Tobol's next round opponent will be Barsy 2 (#6) in Atyrau. Sinegorie K. will play on the road against Almat.Legion in Alma-Ata and it may be a tough game between close rivals. National League top team - Astana (25-0) had no problems winning another game on Thursday. This time they crushed sixth ranked Barsy 2 (5-21) in Atyrau 98-41. Astana have an impressive nine-game winning streak. Defending champion maintains first position with 25-0 record. Barsy 2 lost third consecutive game. Newly promoted team keeps the sixth place with 21 games lost. Astana are looking forward to face bottom-ranked Kaspiy Aktau (#7) at home in the next round where they are favorite. 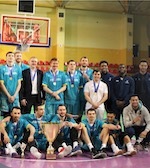 Barsy 2 will play against the league's second-placed Tobol in Kostanay and is hoping to prove to their fans that they can break losing series. National League top team - Astana (25-0) had no problems winning another game. This time they crushed sixth ranked Barsy 2 (5-21) in Atyrau 101-14. Astana have an impressive nine-game winning streak. Defending champion maintains first position with 25-0 record. Barsy 2 lost third consecutive game. Newly promoted team keeps the sixth place with 21 games lost. Astana will play against bottom-ranked Kaspiy Aktau (#7) at home in the next round where they are favorite. Barsy 2 will play against the league's second-placed Tobol in Kostanay and hopes to get back on the winning track.